There’s some wicked stuff going on in the recently released teaser posters for Darren Aronofsky’s upcoming film Black Swan. While the premise sounds a little odd, oddity and insanity aren’t new topics for Aronofsky, who’s first film was about a possessed mathematician in search of a formula to forecast the stock market — oh yeah, and he suffers from debilitating migraine/seizure fits as a result from staring at the sun as a child. 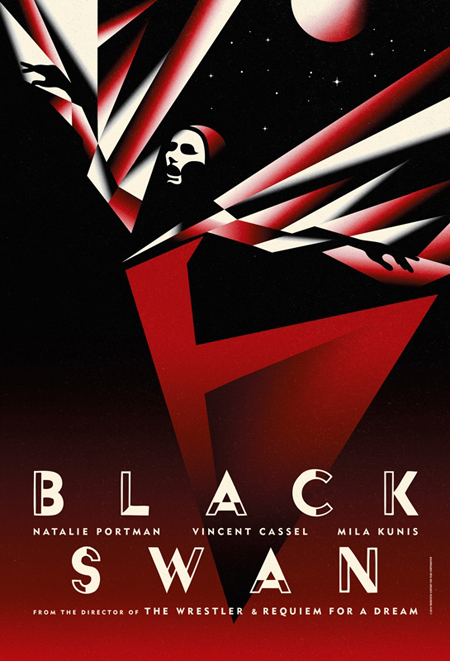 I’m loving the avant-garde/futurist appeal, harkening back to old European theatrical posters.